Hatters boss Nathan Jones admitted that the direct threat he perceived Morecambe would bring to Kenilworth Road on Saturday was the main reason behind dropping youngster Akin Famewo to the bench. The teenage centre half had made his first league appearance for well over a year during last weekend’s trip to Chesterfield and had been tipped to stay in the side despite the 2-0 reverse. I’m happy with the changes we made. I thought they were the right ones to make, and it’s proved it now, but it’s what the manager does. 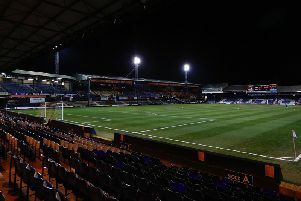 However, Jones opted to switch Glen Rea to partner Johnny Mullins in the heart of Town’s back-line, with Olly Lee moving to the holding midfield role, as when asked why, the Luton chief said: “Because of the directness of them, we thought they were going to come with (Kevin) Ellison and (Vadaine) Oliver who are two big ones and that’s not Akin’s strength. “He’s still learning the game and wants to win everything and is a little bit naive at times, but he’s learning. “We’ve been short in that department with (Scott) Cuthbert going down and (Alan) Sheehan’s expulsion, but we felt that’s what needed to do and it’s proved. “We weren’t brilliant today, but I thought Glen Rea, Mullins got the goal, they were both excellent late on when they were put under pressure. “We put Olly in there to get us on the ball and to play and I thought we must have had 60-65 per cent of possession first half. “If we’d taken the lead, it would have been a different game then, slightly more open and better for us, but I’m happy with the changes we made. It wasn’t just Famewo who had to make do with a place on the bench, as he was accompanied by James Justin, with Jack Stacey restored to theright back position. Jones continued: “It takes a lot to leave Jack Stacey out as I think he’s a wonderful footballer. “He’s been brilliant for us and the trouble is we’ve got an excellent one in James Justin. “To be on the front foot and what we need to win this game, we felt he was better suited. Match-winner Mullins, who played in both matches, felt it had been tough on Famewo to drop out, saying: “I think so, but the gaffer’s got decisions to make and he’s got a real big squad. “I think Akin was really good last week and probably anyone could have come out from last week, it was a real poor performance and we just wanted to make sure that we rectified that in some sense. Meanwile, keeper Marek Stech spoke of Stacey’s recall into the defence ahead of Justin, adding: “It is one of them where JJ has been doing really, really well, he’s come in when Stace got sent off for the three games and he stayed there. “It’s the gaffer’s decision who he’s going to put in the team and Stace came in again and performed well.